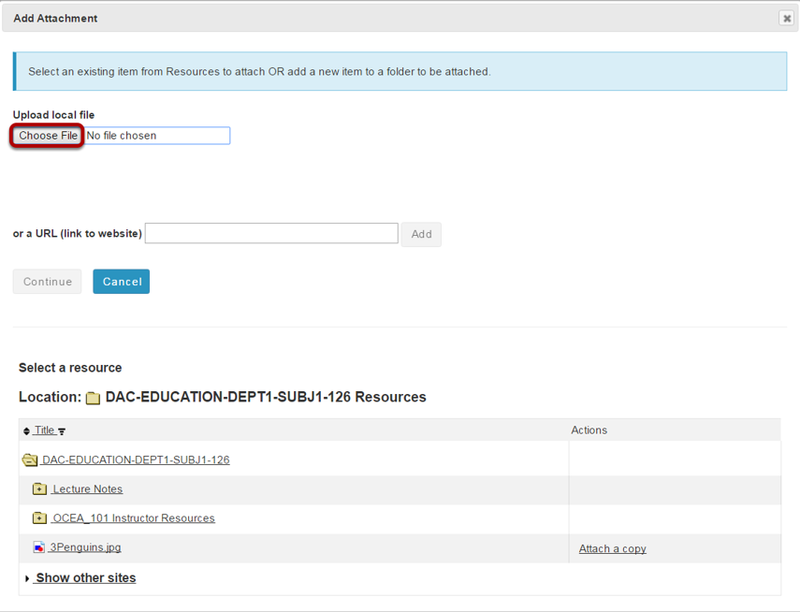 Instructor User Guide PostEmHow do I add PostEm feedback? Your file must be saved in .CSV format. You can save Microsoft Excel spreadsheets as CSV files. The first column of your file must contain individuals' usernames in lower case. For students, the username is typically their Rutgers netID. For guests, this is typically their email address. The first row of your file must contain headings. You may label your headings anything you wish, the only requirement is that there is a heading for every column that contains information. 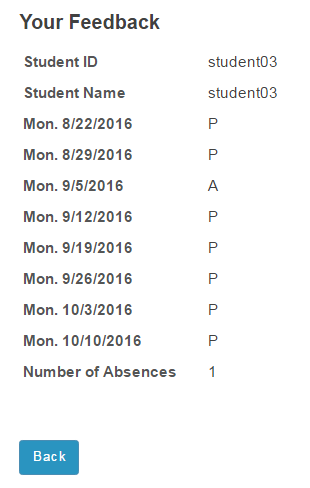 Tip: You can download a CSV file that includes the student usernames under Gradebook > All Grades > Export as CSV (or from Gradebook2 > Tools > Export). 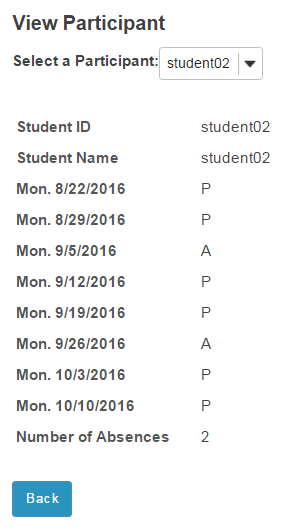 You can also download a CSV file that includes the student usernames under Roster > Export. Example of a properly formatted CSV file. Zoom: Example of a properly formatted CSV file. Enter a Title for the Feedback file. This is the title students will see when they go to PostEm to view their feedback. 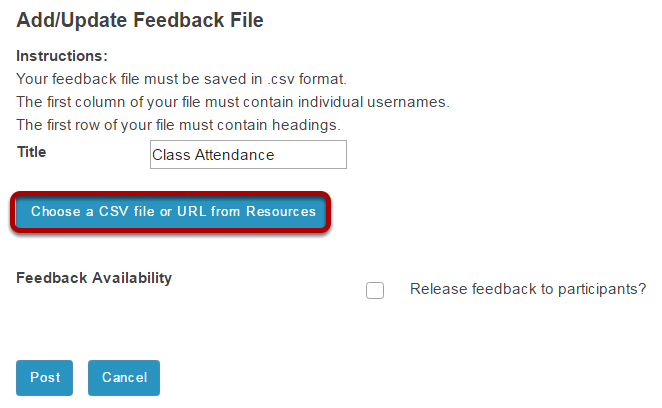 Click the Choose a CSV file or URL from Resources button to select your file. You may select a file that you have already uploaded to your site, or click the Choose File button to locate the file on your computer and select it for upload. Zoom: Release feedback and Post. 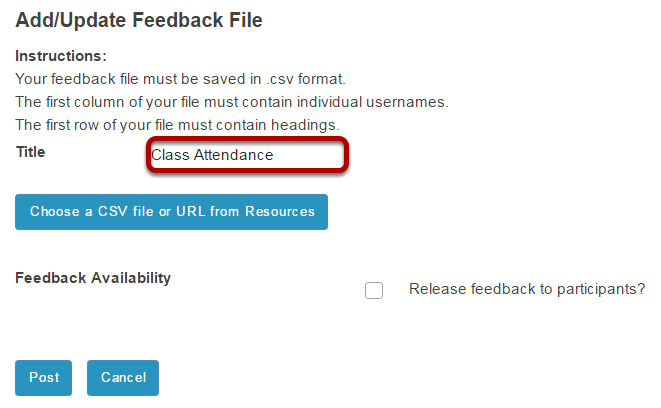 Check the box next to Release feedback to participants? and then click Post. You will be prompted to verify your file upload. The first row of data will be previewed for you. If everything looks correct, click Save. To view feedback for all students, click View. Zoom: To view feedback for all students, click View. This displays all of the feedback and when (if ever) the student last checked their feedback. To view feedback for one student, click View Participant. Zoom: To view feedback for one student, click View Participant. This displays the individual student's feedback. 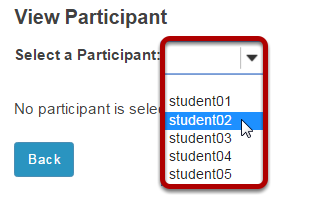 Choose the student you want to view from the drop-down menu of participant usernames. To update the feedback file, click Update. Zoom: To update the feedback file, click Update. If you would like to replace the CSV file with a different file, click Update. Zoom: Select a new file and Post. Tip: If you want to hide the feedback from students, remove the check mark next to Release feedback to participants. To delete the feedback, click Delete. Zoom: To delete the feedback, click Delete. Example of what a student sees in the PostEm tool. Zoom: Example of what a student sees in the PostEm tool. 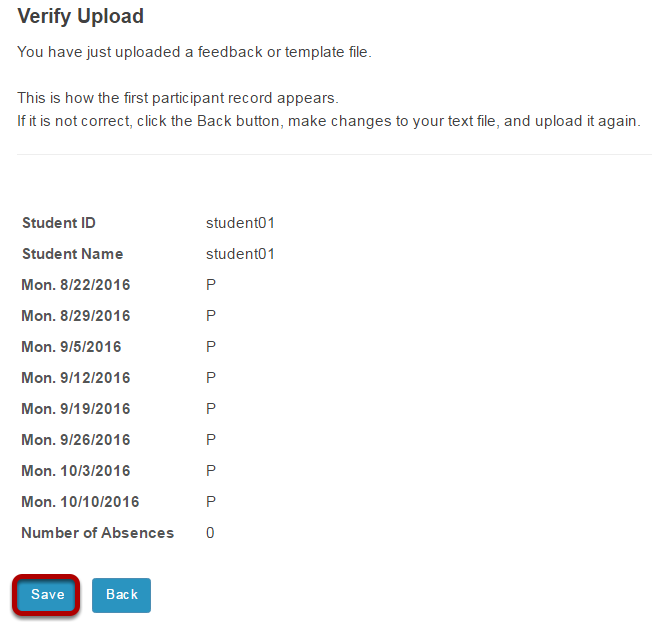 Students will see the title of the feedback file, and the date it was last modified. They can click on View to see their individual feedback. Student view of individual feedback. Prev: What is the PostEm tool?